President Recep Tayyip Erdogan on Monday vowed Turkey would remove a Kurdish militia viewed as terrorists by Ankara from northern Syria if the US failed to ensure fighters leave the east of the Euphrates. The threat comes after Erdogan spoke on the phone with U.S. President Donald Trump on Friday when the pair agreed to ensure "more effective coordination" between their countries' operations in Syria. The conversation followed threats from Erdogan last week to launch an offensive against the U.S.-backed Kurdish People's Protection Units (YPG) militia east of the Euphrates River, where there are American troops, within the "next few days." "I spoke with Trump. The terrorists must leave the east of the Euphrates. If they don't go, we will remove them," Erdogan promised during a televised speech in the central Turkish province of Konya. "They [the YPG] are a source of discomfort with their terror corridor," Erdogan said. Although Erdogan said that Turkey could start an operation "at any moment", he appeared to indicate there was room for negotiation with the U.S.
"Since we are strategic partners with America, then we must do what is necessary," said Erdogan. But he added that the U.S. "must fulfill promises" without giving further detail. 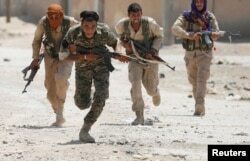 The YPG has spearheaded Washington's fight against the Islamic State (IS) extremist group in Syria under the banner of the Kurdish-led Syrian Democratic Forces (SDF). But U.S. support for the YPG has strained relations between the NATO allies, which worsened recently after the US set up observation posts in northern Syria close to the border with Turkey to prevent any altercation between Turkish forces and the YPG. Turkey has launched two military operations helping Syrian rebels to recapture territory in Syria from IS and the YPG in August 2016 and January 2018 respectively. A Kurdish People's Protection Units (YPG) fighter walks near residents who had fled Tel Abyad, as they re-enter Syria from Turkey after the YPG took control of the area, at Tel Abyad town, Raqqa governorate, Syria, June 23, 2015. The first offensive in northern Syria lasted until March 2017 targeting IS on the Turkey-Syria border and to stop the YPG gaining more territory. FILE - In this March 24, 2018 file photo, Turkish soldiers atop an armored personnel carrier secure the streets of the northwestern city of Afrin, Syria.